The Nifty 120T trailer mount is specifically designed to give maximum reach performance from the most compact chassis possible. By utilising its versatile telescopic upper boom, the Nifty 120T trailer mount delivers unrivalled working outreach, especially at lower levels where it’s needed most. Hydraulically operated outriggers make setting up the Nifty 120T trailer mount both quick and easy. 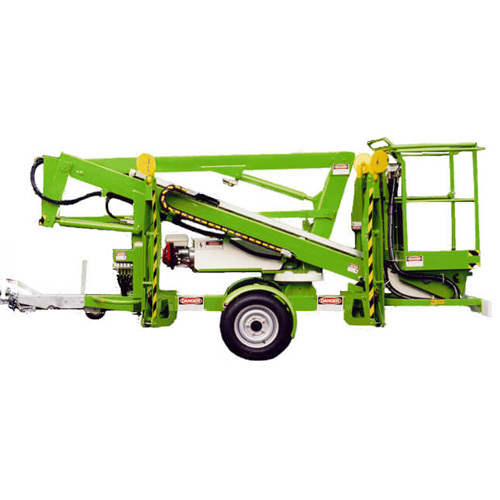 This machine is also fitted with traction drive and a can be used either with batteries or its Honda engine. Special Notes: Refill and recharge before returning. Insurance required. Please note: these are recommendations only. For full safety information about this product, please read the safety manual. This is an enquiry form only. A member of TVE staff will contact you to discuss prices and availibility. © Copyright TVE Oxfordshire Plant & Tool Hire.